The Miami Dolphins had a last-second shot to land Teddy Bridgewater and failed. 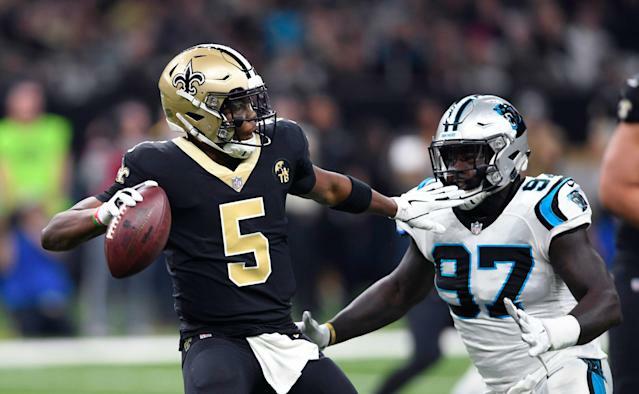 The 26-year-old Bridgewater agreed to return to the New Orleans Saints on a one-year deal Thursday, according to ESPN’s Dianna Russini. Bridgewater’s deal will be worth $7.25 million, according to Adam Schefter. He’s expected to once again back up 40-year-old Drew Brees. That may not have been the case had Bridgewater signed in Miami. Bridgewater would have at least competed for the starting role with Ryan Tannehill. Bridgewater may have even been the favorite to win that job, especially considering the Dolphins turned over their coaching staff during the offseason. Bridgewater was drafted by the Minnesota Vikings in the first round of the 2014 NFL draft. He started 28 games in his first two seasons with the team, throwing 28 touchdowns to 22 interceptions. Big things were expected of Bridgewater during his third season, but a gruesome leg injury — in which he almost lost his leg — caused him to miss the entire 2016 season. He played in one game with the Vikings in 2017 before joining the Saints in 2018. While Bridgewater won’t have many opportunities to start in New Orleans, he opted to stay somewhere he was comfortable. The Dolphins reportedly offered him more money, but it wasn’t enough to convince Bridgewater to leave. The team even tried to make a last-second push for Bridgewater, meeting with him Wednesday night, but that didn’t work either.